This clearly written easy-to-follow step-by-step guide enables even the novice jewelry artist to make Egyptian Coil links like a pro, and then create a beautiful bracelet with them. Complete with numerous large clear photos, this 8 page guide takes the guesswork out of this complicated looking yet simple to make link. This tutorial has been used by numerous students in my wire jewelry classes and online with consistent success! Here's what one person said who had just tried it for the first time. "Stacy, I finally got some time to try out the tutorial and I wanted to thank you for the great instructions. It was very easy to follow and the bracelet came out wonderfully!" After payment, you'll receive your two-part tutorial via email in a downloadable and printable PDF file. I know you'll really enjoy this fun Egyptian Coil Bracelet tutorial. $6.95 Click here to purchase. 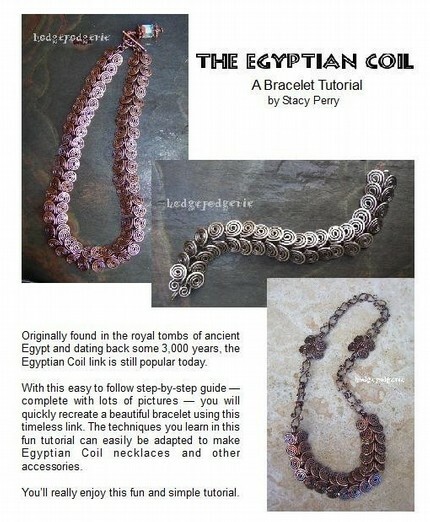 Return from "Egyptian Coil Bracelet Tutorial" page to "Wire Jewelry Tutorials" page.